MAN Trucks today announced new initiatives that the company will roll out in 2018. These include introduction of Mobile24 & MAN ProfiDrive® and introduction of new digital tools for customer connect. Mobile24 is a 24x7 roadside assistance service that will support all MAN trucks & buses operating in the country, especially haulage vehicles. This will also be included in repair maintenance contracts (RMC) that can be customised to suit specific customer requirements. The MAN ProfiDrive® programme will provide training to drivers to help them operate with better safety and deliver greater fuel efficiency. MAN will also offer customer solutions using digital platform that will make the interaction with the company more value-driven and efficient. These initiatives will be rolled out in a phased manner in 2018. The announcement was made at the company’s factory in Pithampur to mark the successful conclusion of The MAN Expedition. The Pan-India drive comprising four tractors and a rigid truck concluded with all the vehicles arriving at Pithampur. The activity included the CLA Evo 40.250, 49.250 and 49.300 tractors and 31.300 rigid truck. All these vehicles carried rated payload to demonstrate performance in true operating conditions. The three routes accounted for over 9,000 kms traversed by the vehicles that stopped at 29 dealer locations across India. With Mobile24, customers can access MAN roadside assistance 24x7. Customers get the immediate response by calling our call centre where a qualified agent sets everything in motion to ensure help reaches as quickly as possible. This will benefit the haulage operators immensely as efficient transport is an inherent requirement of the logistics business. With 35 years of expertise, MAN ProfiDrive® has made a significant contribution to the all-round support for business owners, fleet managers and drivers in over 67 countries worldwide. MAN ProfiDrive® has continuously improved and expanded in terms of its daily dealings with customers as well as the available training portfolio. These initiatives compliment the reliability and efficiency of the MAN CLA Evo haulage series. The products offer unique benefits such as highest payload in their respective categories; best-in-class fuel efficiency; unmatched 20-hour duty cycle; and maximum product lifecycle. Offered along with Aftersales customer solutions such as Repair Maintenance Contracts, lubricants and coolant, customers get the best value proposition. The established TCO concept is the ultimate benefit that MAN customers have experienced over the years. Some of the earliest vehicles sold by MAN Trucks in India are still operations. These include tractors that transport over dimensional cargo (ODC) having clocked nearly 10 lakh kilometres and continue to do so. The New CLA EVO series trucks are powered by the proven MAN D-0836, turbo charged, inter-cooled engine, that is rated for 250HP and 300HP. Mated with 6- and 9-speed gearboxes, the trucks are adapted for specific operational purposes. The electronically-controlled Common Rail system makes the engine high on reliability and fuel efficiency, besides being more environment friendly. The crawler gear in long haul trucks helps the engine run within the optimal rpm range, thereby reducing fuel consumption. Strong rigid front axle, hypoid rear axles provide superior traction &grade ability, and unmatched reliability. The tippers feature MAN‘s planetary rear axle with hub reduction, which provides high ground clearance and has proven its effectiveness in varying conditions. The inter axle and differential lock imparts superior traction. MAN Trucks India offers service and support to ensure maximum uptime, all the time. MAN Services offers include warranty schemes, RMCs, on-site support and 24x7 helpline service. 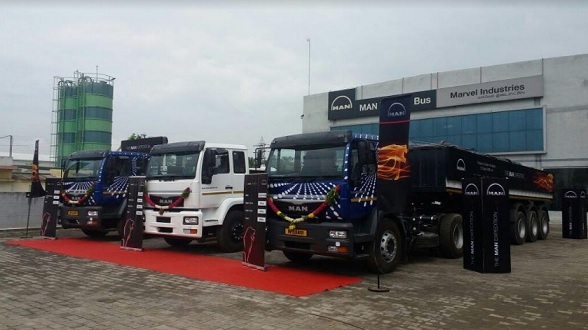 MAN Trucks India Pvt. Ltd. is a fully owned subsidiary of MAN Truck & Bus AG, Germany. The company has its Head Quarters in Pune and state-of-the-art manufacturing facility at Pithampur, Madhya Pradesh. The product range manufactured in this plant include tippers for off-road & construction, haulage for regular & over dimensional cargo, and special application trucks such as fire tenders, garbage compactors, concrete mixers, boom pumps, tip trailers and bulkers. The product range for India is developed at MAN Trucks R&D centre in Pune. The trucks made in India are also exported to African and Asian markets. 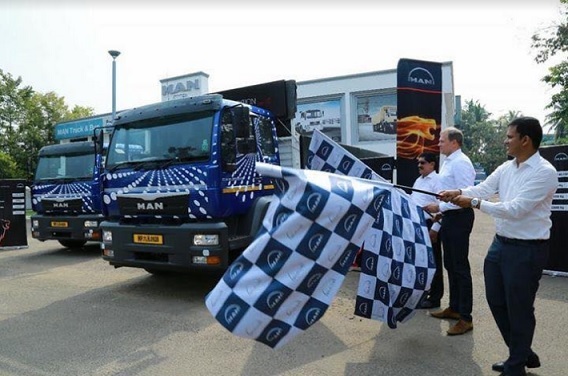 MAN Trucks offers prompt and efficient support through its network of 65 touch points in India and one each in Bangladesh, Bhutan and Nepal. The company has sold over 27,000 trucks since it started its India operations in 2006.